One shouldn’t drench tape in vinegar or heat it in the microwave. Nor should one use an ice cube tray to repeatedly freeze a hydrophone, or place screwdrivers across the strings of a piano. Yet these are things that Anna Rose Carter and Ed Hamilton like to do, and their curious tendencies can be heard in the background of the songs on their debut album as Dead Light. Carter and Hamilton claim that this is an album about ambivalence, sparked by a move from the city to the country, but ambivalence implies lack of caring, while this album demonstrates the opposite. The duo cares enough to pretend they don’t care, and their dead light is actually alive. This life is evident in the title and sound of the lead single and opening track, “Blooms”. Other tracks will whisper and gently fall like dust in an October sunbeam, but “Blooms” reflects the hope of new life and the vast discoveries that await. Dead Light is certainly not a city album, nor a summer album, but it is clearly an album of transitory thought, reflecting the melancholy of fall. When the strings enter on “Slow Slowly”, they sing of loss in such a way as to imply gain, the electronics surging in as if to say that they want to be part of the party too. The track ends as abruptly as a power outage, the only false note; from this point forth, the album flows like memories on a prairie porch. Carter offers melodies gentle and sweet, the innards of the prepared piano unable to sour her notes. Hamilton’s loops are like regrets; they tumble (literally, as some were placed in a washing machine), but at the end of every track, they disappear. “Sleeper” offers the album’s most distinctive moments, a Caretaker-esque sample of string and static joined by wordless, wandering voice. The electronics sound like migrating geese, so clear a metaphor that it is likely intentional. 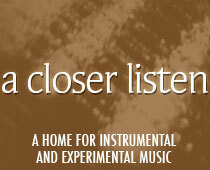 But the resonant cello of “Little Blue” offers the album’s deepest sonic well.